Naomi Danis is Lilith’s resident angel/soother of souls/bridge over troubled waters. She combines a practical-get-it-done attitude with an uncommon amount of kindness and empathy and she is much-loved within the office and beyond. 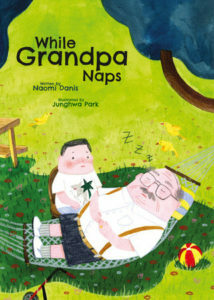 Danis is also an accomplished author of several well-received picture books and as she prepares to launch her latest, While Grandpa Naps, illustrated by Junghwa Park, she talks to Fiction Editor Yona Zeldis McDonough about the way she keeps so many balls spinning in the air with such effortless grace. YZM: Tell us when you started working at Lilith and a little bit about what the job has been like. ND: I started working at Lilith in 1988, after nine years at home raising three children, during which time I began seriously writing for kids. I had trained as an early childhood teacher, also have an MA in English, but learned from a friend at my Forest Hills synagogue who did grant writing that Lilith was looking for someone. The position turned out to be administrator, and I really wanted to be called something like assistant editor, but two friends in publishing I consulted said if you like the people, take the job. I still love it after all these years, and feel very lucky and grateful every day. I have the kindest, smartest, funniest, most caring, talented, inspiring and encouraging colleagues.